Play some fun, simple age-appropriate icebreakers — at least one that introduces kids to one another. Empty colourful balls around the class and get kids to pick them up and put back in box. Get all the kids to introduce themselves. Divide class into 2 teams. Hold a large blanket in between. Each team sends a representative to sit in front of the blanket. When blanket is dropped, first side to shout out name of the other wins a point for their team. Fun action song for all ages … can go faster and faster, removing certain words each time etc. Why were the disciples so afraid? Have you ever been afraid? Stressed? Worried? As we go into this new year, there are lots of uncertainties. You may be in a new school, or facing a big exam, or your parents may be facing certain challenges in their jobs that could affect you. 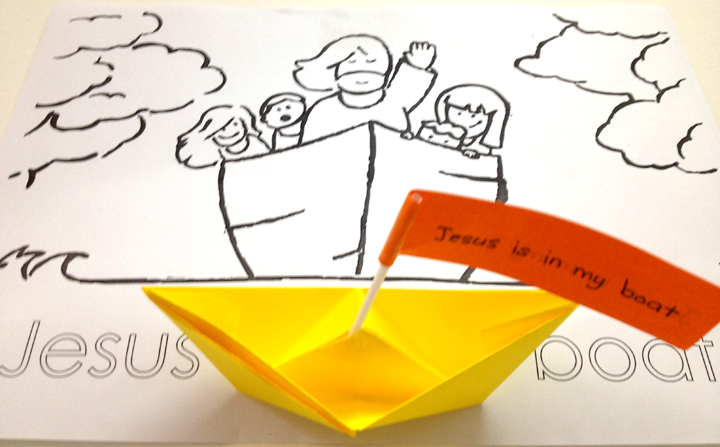 Jesus is in the boat with us — He’s the one who said, “Let us go to the other side …”. He is not bringing us into the middle of the lake to drown. In this case, Jesus shut the storm up (He’s God and He’s all powerful!). But sometimes He allows the storm to rage on. But whatever it is, no matter how big the storm is, no matter how much water is flooding into the boat, we will get through it because Jesus is with us. Jesus cares! The disciples weren’t sure (“Teacher, don’t you care if we drown?”). Sometimes when we face problems, we feel God isn’t there, that He doesn’t care. But we need to remind ourselves that Jesus really loves us, He cares for us and He never leaves us! Jesus could sleep through the storm. When we really know Jesus is with us, we can rest (or even smile) in the storm. Just keep our eyes on Jesus through it all! Get kids to share a prayer point — something they are looking to Jesus for this year.